Located off the white sands of Malcolm beach, the Amanyara Resort is great for the nature-focused traveler who wants to get off the grid for a bit. The four-bedroom Beach Villa can host a total of 8 guests, so it’s perfect for a larger family or a couples’ retreat. You have access to an infinity pool, a fully-equipped kitchen, and a lounging/dining pavilion, not to mention the outstanding scenery and rejuvenating environment. Spa treatments are plentiful here and if you’re feeling more energetic, you can take part in any of the resort activities like snorkeling trips, water sports, tennis courts, and yoga. Your personal chef and attendant will make sure you’re not only well fed, but that you have everything you need during your stay. Resort amenities, luxury accommodations, beachfront! Amanyara is a luxurious resort on the secluded, western coast of Providenciales. Nestled on an 18,000 acre nature preserve, this four-bedroom villa enjoys privacy and proximity to Malcolm Beach. The Beach Villa enjoys a mosaic-tiled infinity pool. A gazebo and sun deck rest on either side of the pool, with loungers and an umbrella for sunbathing. The gazebo shades al fresco dining, and thick foliage provides privacy. There’s also an outdoor shower for guests’ convenience. Reflecting ponds mirror the blue skies, and add tranquility to guests’ meditation practice or morning walks. Two four-seater golf carts make it easy for guests to access nearby Malcolm Beach. Amanyara has embraced a contemporary design that features soaring ceilings and an open layout. The interiors are open and modern, with a flatscreen TV, DVD player, and surround sound in the living area. The long dining table seats 10. The kitchen is fully equipped with stainless steel appliances, a coffeemaker, blender, personal bar, and an ice maker. There’s even an onsite gym for guests who want to keep up with their workout regimen. Each of the four bedrooms is in its own pavilion with a king bed, flatscreen TV, and ensuite bathroom with a rain shower and free-standing tub. Air-conditioning and WiFi run throughout the villa, and a daily chef and housekeeper attend to guests’ needs. 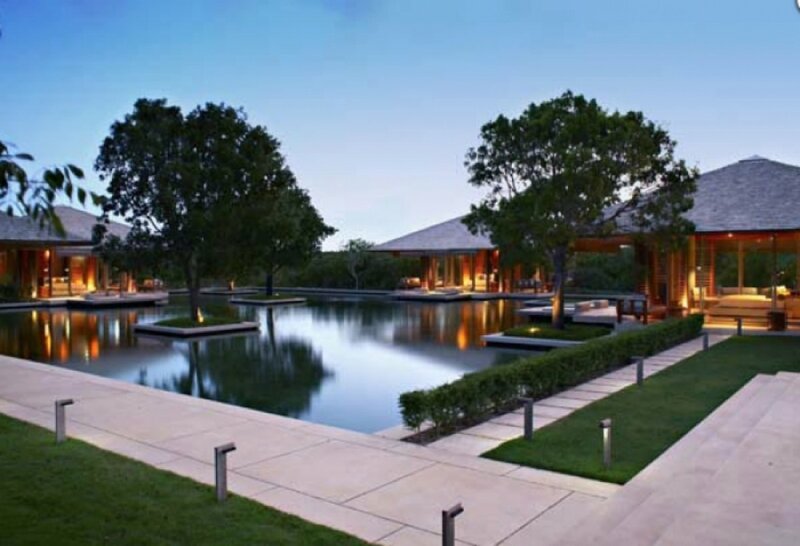 Amanyara has four spa pavilions, outdoor yoga, and a Pilates studio. The ocean-view restaurant has indoor and outdoor dining and serves freshly caught seafood. Families can have fun in the Sports Clubhouse and Nature Discovery Center. Everything at the resort is just a golf cart ride away. Rates do not include: tax of 12%, island charges of 12%. Transfers can be arranged to the villa. For more details speak with your villa specialist. Car rental, grocery and beverage shopping (pre-arrival and during your stay), liquor and wine delivery, nanny service, baby equipment, spa services, yoga and personal training, photography, and private airport transfer/car service can be arranged for an additional fee.